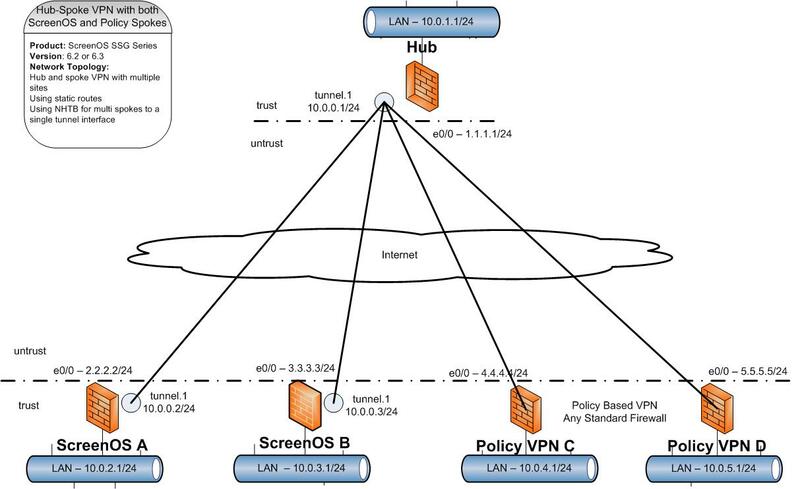 This hub and spoke setup allows multiple sites on either route or policy based VPN to connect to a common tunnel interface. This uses static routes and NHTB (Next hop Tunnel Binding) to direct traffic in the network. 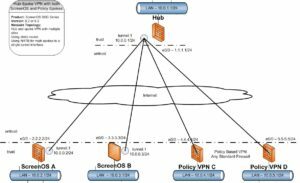 These allow the mixing of SSG and non-SSG policy based VPN on the same hub and spoke network. The configuration requires a base setup on the hub location where primary services are connected. Each spoke then has a configuration set to connect and provide these services to the hub. While the hub adds a section for each new spoke that is created in the system. Configure base services on the hub location. This occurs only once and remains the same no matter how many spokes are added to the system. This zone layout puts all sites and tunnels into the same security zone. No policies need to be created on any device for full communications across the entire core and remote network. This is assuming that intra zone blocking is NOT enabled on any of the firewalls for the trust zone. This is the default behavior for the trust zone. You can change the zone of the tunnel interface to untrust and create policies as needed to allow traffic. All steps on spokes are identical with exceptions noted below. Change the indicated parameters to match the spoke location on the network as each new spoke is added. These only apply the SSG route based VPN sites. The policy sites are configured by the normal standard on the remote equipment. Running “get route protocol static” on a spoke should show the routes to the hub with a capital S label. The hub site will show all of the sites with their static routes.